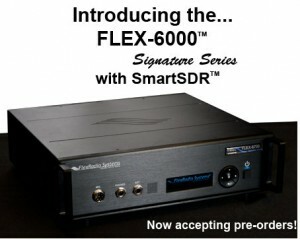 Today, at the Dayton Hamvention, Flex-Radio Systems will introduce their newest transceiver, the Flex 6000. I have read through the preliminary specs and it does promise to be a game changer as they implied in earlier teaser ads. With the FLEX-6000 Signature Series radios, FlexRadio brings a wealth of new capabilities to the amateur including direct digital reception, transmission and networking. At the core of all these new capabilities is SmartSDR. SmartSDR organizes all of the signal processing power in the FLEX-6000 Signature Series radios into an advanced reusable framework. First, the RF subsystems in the FLEX-6000 are virtualized as reusable hardware blocks or Signal Capture Units (SCU) with specific capabilities. SmartSDR understands the capabilities of each SCU and how to harness its power. As data from the SCUs enters the Field Programmable Gate Array (FPGA) at a combined rate of over 7.8Gbps, SmartSDR performs advanced Digital Signal Processing (DSP) on the data, splitting it into individual Panadapters and Slice Receivers. Panadapters are visual displays of the RF spectrum akin to a spectrum analyzer, but with more capabilities for the amateur. Slice Receivers are dynamically allocated full performance receivers that can be directed to the speaker or headphones for listening, or can be streamed as digitized RF to external digital applications. Panadapters and Slice Receivers can be created and destroyed atwill. What distinguishes SmartSDR is the simplification of theseadvanced concepts into an elegant graphical user interface (GUI) that places you in complete control. Want to create an additional Panadapter to watch for possible 10m band openings? No problem, simply click to add the Panadapter and SmartSDR directs everything from the advanced signal processing software down to the filters in the SCU to form an optimized receiver. Want to decode all of the CW signals on 40m while working DX on 20m? It’s just a few clicks away. 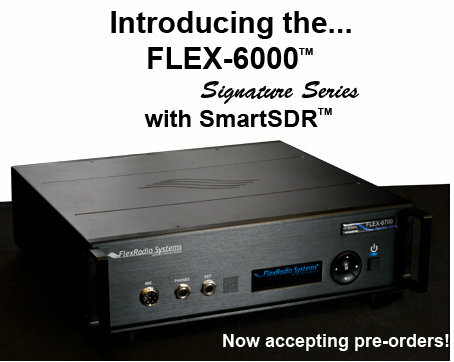 In the future, remote FLEX-6000 Signature Series radios will be equal partners in the SmartSDR ecosystem. Imagine the capabilities: Want to add two remote receivers so you never miss another check-in as Net Control? Just click to add and combine them. The brochure goes into great detail about the Flex 6000’s features. Its networking abilities, multiple receivers and even frequency lock that is tied into the GPS system will make this SDR stand out from the crowd. Prices vary from $3999 for the Flex-6500 to $6999 for the Flex-6700. FlexRadio is taking deposits on pre-orders.